I begin my analyses of July's sales by looking at zip code 20024 using data provided by MRIS and RBI. 20024 is roughly bordered by the Potomac and Anacostia Rivers, South Capitol St, and Independence Avenue. It's home to many of our nation's memorials and parks as well as the Southwest and Waterfront neighborhood. You can find the memorial to the Titanic here [did you know such a memorial was located in DC?] and Arena Stage. Aggregate dollar volume was up 70.3% over the same month in 2010. Unit sales were 88.89% higher. The average price for a home fell 8.44%, the median price was down 4.99%. No houses were sold during July. No homes were sold as a bank-mediated sale. The average price for condos was $302,641, up 5.33%. Condo sales prices ranged from $50-500K, with one condo selling for $800K-1M. For the past twelve months, condos have dominated sales in 20024, averaging 12 condos and 1 house sold per month. There were 60 active listings during July, 56 condos and 4 houses. The list prices for condos ranged $100-600K, with more than half in the $200-400K price point. One condo was listed for $800K-1M. 20024 represented 1.48% of July's dollar volume in the District. Its average price was 49.05% less than the District's, its median price 41.69% lower. 20024's unit sales were 2.91% of all sales in the District in July. According to MRIS, properties in 20024 sold for 88.6% of the listing price. At July's sales rate, there's a 3.3 months supply of condos. A healthy market for sellers. Zip code 20024 offers close proximity to many of the Federal government's offices and the waterfront lifestyle is appealing, too. A lot of development has been happening in the area thanks to the new-ish Nationals Park. But this probably isn't the area for you if you want a detached home. Otherwise, its affordable condo prices [relative to the District as a whole] make it an area worth considering when shopping for a condo. I wrap up my review of June's closed sales by looking at zip code 20816 using data provided by MRIS and RBI. Bordered by the District line, the Potomac River, River Road, and Goldsboro Road, 20816 is home to the Glen Echo Heights and Glen Mar Park neighborhoods. Aggregate dollar volume was down 30.13% over the same month in 2010. Unit sales were 23.68% lower. The average price for a home fell 8.44%, the median price was down 4.99%. Houses accounted for 79.31% of units sold. All houses sold were detached houses. No home was sold through a bank-mediated sale. The average price for condos was $439,583 down 23.8%. The average price for a house was down 6.31%, to $938,676. Condo sales prices ranged from $200-500K. Houses sold in the range $500K-2.5M; six houses sold for $1-2.5M, all having at least 4 bedrooms. More detached houses, 23, sold in June than during any of the previous 12 months. The median monthly sales rate for 20816 is 13 detached houses. There were 57 active listings during June, 10 condos and 47 houses. 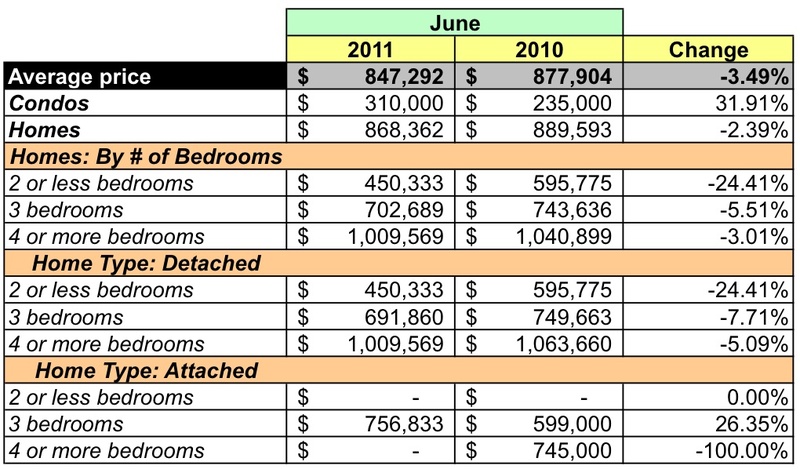 The list prices for condos ranged $200-500K, with the median somewhere in the $300-399K price point. Of the 47 houses listed, 7 were priced $600-800K, the remainder ranged upwards to more than $5M; most were in the $800K-2.5M price range. According to MRIS, properties in 20816 sold for 97.7% of the listing price. 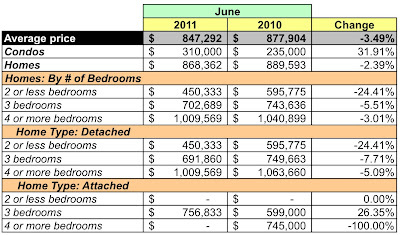 At June's sales rate, there's less than 2 months supply of condos and a 2 months supply of houses. A seller's market. As if to emphasize that point, the average days on market was 57 days in June, a 20% drop from the prior year. Just as I said last week about 22207, zip code 20816 is a good area for those who want a detached house, but its high average sales price may be greater than many can accommodate. With the low inventories buyers should be prepared to move quickly if they find a house they like. 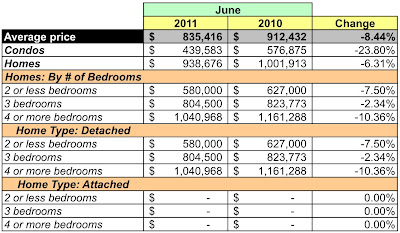 This week I look at June's closed sales for zip code 22207 using data provided by MRIS and RBI. Roughly squeezed in between the Potomac River and I-66, 22207 is above and adjacent to zip code 22201, which I analyzed a few weeks ago. It's home to the Old Glebe, Bellevue Forest, Yorktown, and Cherrydale neighborhoods. Aggregate dollar volume was down 8.66% over the same month in 2010. Unit sales were 5.36% lower. The average price for a home fell 3.49%, the median price was up 3.87%. Houses accounted for 96.23% of units sold. The average price for condos was $310,000, up 31.91%. The average price for a house was down 2.39%, to $868,362. Condo sales prices ranged from $200-400K. All but six houses sold in the range $600K-2.5M. Sixteen houses sold for $1-2.5M, all but one having at least 4 bedrooms. More detached houses, 48, sold in June than during any of the previous 12 months. The median monthly sales rate for 22207 is 30 detached houses. There were 134 active listings during June, 14 condos and 120 houses. 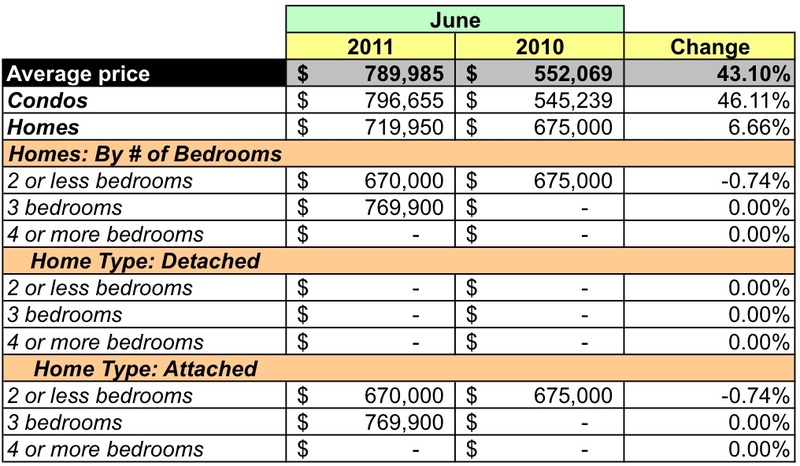 The listed prices for condos range $150-600K, with the median somewhere in the $200-299K price point. Of the 120 houses listed, only 16 were priced below $600K and 55 were priced between $1-5M. Last June's market was the most active June since June 2007. In addition to the 53 contracts that closed, 31 homes went under contract and another 40 homes went under contingent contracts. According to MRIS, properties in 22207 sold for 96.6% of the listing price. 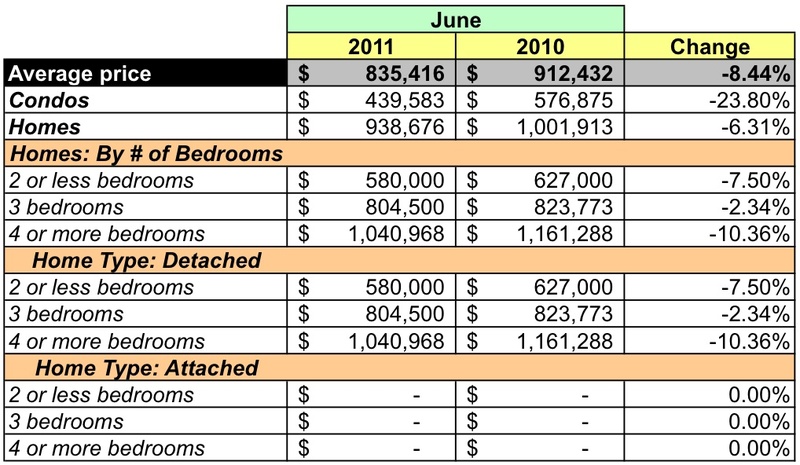 At June's sales rate and assuming the S&P downgrade of US sovereign debt has zero effect on the real estate market, there's a 7 months supply of condos and a 2.35 months supply of houses. The data show that zip code 22207 is a good area for those who want a detached house, but its high average sales price may be greater than many can accommodate. And as with many other zip codes I've looked at over the past few months, given the low inventories buyers should be prepared to move quickly if they find a house they like. 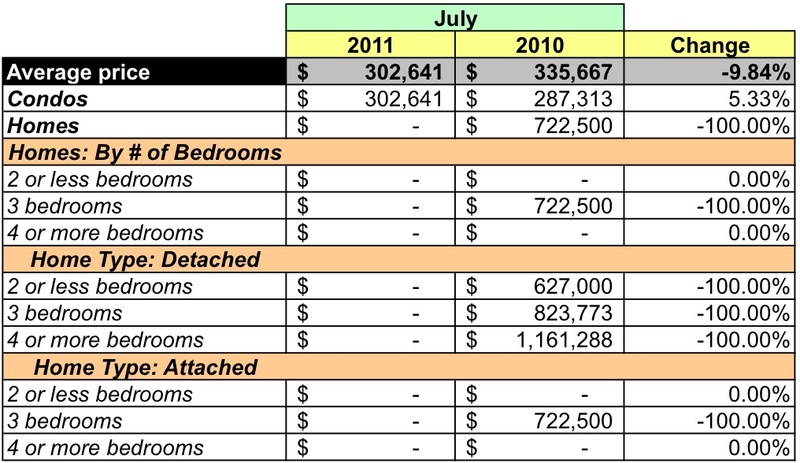 I begin August with June's closed sales for zip code 20037 using data provided by MRIS and RBI. 20037 is home to the West End and Foggy Bottom neighborhoods. You'll also find the Kennedy Center and the Watergate there. And at the corner of Rock Creek Parkway and Virginia Avenue NW, you can buy the most expensive gasoline in Washington, DC. Aggregate dollar volume was up 73.22% over the same month in 2010. Unit sales were 21.05% higher. The average price for a home was up a whopping 43.1% and the median price was a more moderate 16.11% higher. Condos accounted for 92.08% of units sold. Condos rule! 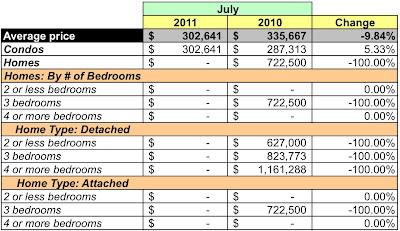 The number of condos and houses sold was about the same as June 2010. One unit was sold through a bank-mediated short sale for $455,000. The average price for condos was $796,655, up 46.11%. Houses were up, although not as spectacularly, up 6.66%. Condo sales prices ranged from $150K-5M. The two houses sold in the range $600-799K. Let's not get too excited thinking that the condo market is making a tremendous rebound. Six of 21 condos sold for more than $1MM, including one that sold for between $2.5-5M. Obviously, these sales skewed all the average pricing metrics. Even so, a 16.11% bump in the median price isn't something to sneeze at. For those looking to buy a condo, the average price during the past twelve months for a studio has been $184,023, for a one bedroom unit $407,304, and for a two bedroom unit $932,172. 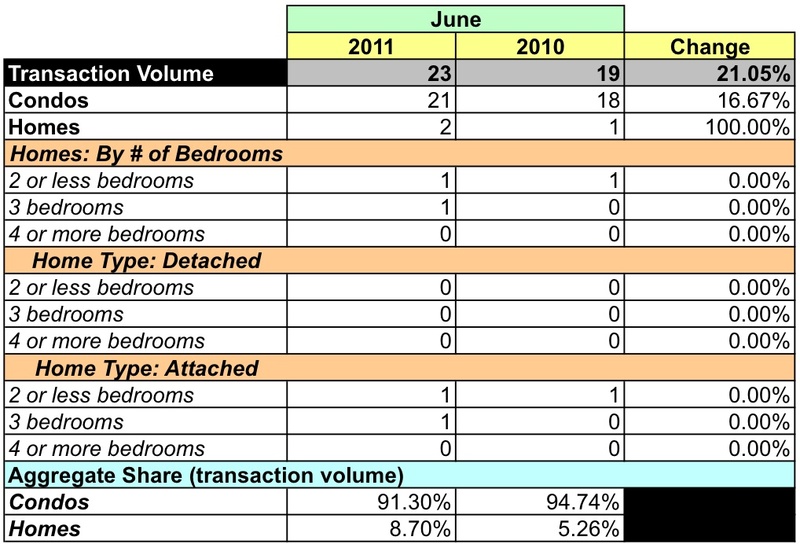 There were 146 active listings during June, 142 condos and 4 houses (did I mention condos rule here?). 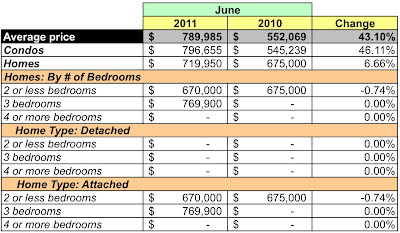 The listed prices for condos range $150K-5M, with the median somewhere in the $500-599K price point. Two of the four houses were listed for $600-800K and two were listed for $1-2.5M. During June, 12 homes went under contract and another 13 went under contingent contracts. According to MRIS, properties in 20037 sold for 93.8% of the listing price. At June's sales rate, there's 6.76 months supply of condos and a 2 months supply of houses. 20037's dollar volume was 4.78% of the District's June dollar volume. Its average price was 37.79% higher than the District average and its median price was 26.78% higher. Its unit sales were 3.47% of all units sold. The data show that zip code 20037 is not a high volume zip code; during the past twelve months it's averaged 16 house and condo sales per month, wit the distribution of sales leaning heavily towards condos. The supply of many condos for sale at such a broad price range means there's probably something for anyone who wants a condo near the Kennedy Center, the State Department, or the bar at the Ritz-Carlton.